If you have ever struggled with how to get rid of fleas on dogs, then you know how frustrating it can be. Instead of driving both you and your dog crazy, follow a few simple guidelines and you should soon be on your way to flea free living. Your dog begins scratching himself much more than usual as well as chewing and licking himself more. He may pace and move around a lot as if he's uncomfortable settling. Head shaking and scratching his ears, with redness in the ear area. Look for "flea dirt" on his skin which looks like small dark specks. Flea infestations tend to happen in specific areas such as inside the armpits, groin and ears and along the back. The skin should also show signs of irritation including redness, scabs, bumps and loss of hair. You may also see them moving if you look quickly enough. With serious infestations you are likely to see more of them. You can also use a flea comb for dogs with longer, thicker hair to find them. If you comb fleas out immediately put the comb in a solution of water and soap or flea shampoo to kill them. If you're not sure there are fleas or not, some dog owners put a white towel, bed sheet or piece of paper under the dog while they are combing. Fleas can fall down and show up against the white background. If you wet the area, the flea dirt should turn a reddish color. Do Fleas Live in a Dog's Ears? The presence of "flea dirt" in the ears. Redness, irritation, swelling and bumps in the ear. Repeated head shaking and scratching at the ears. 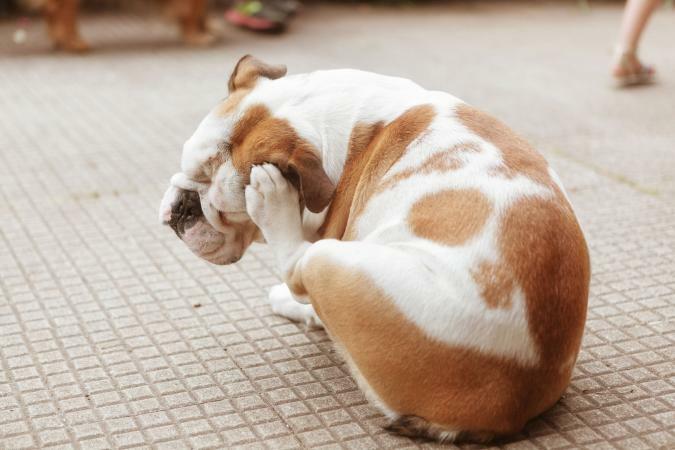 An ear infection, which can be caused by bacteria from the fleas entering open wounds in the ears caused by scratching as well as flea bites. If you notice the above symptoms related to your dog's ear, consult with a veterinarian as an ear infection caused by flea bites will require prescription medication. Unfortunately fleas will live in other areas of your house once they have infested your dog. They can fall off and live in your carpets, on your dog's bed (or your bed) and areas of your house with natural light such as windows. If your dog has fleas, you'll most likely need to treat your home as well to get rid of them as they will spend their time off your dog laying eggs to create more fleas. While prevention is the best option for ensuring your dog is healthy and flea free, infestations can happen. Remove all bedding or linens where your pet sleeps and run through the washing machine using hot water to kill any fleas or eggs nesting inside. Vacuum all areas of your home that contain carpet, including rugs and drapes, and don't forget other floors such as hardwood, tile, and linoleum. Make sure you immediately throw out the vacuum bags each time you are done. It may also be beneficial to "bomb" your house using can foggers designed specifically to kill fleas. Make sure all pets are removed from the home prior to fogging and that all edible items, such as fruit, are put away into cabinets and not left on out on counters. For large homes, several foggers may need to be used to kill all the fleas. If your infestation is severe, you should contact a professional to treat your house. Wash your dog with a shampoo specifically designed to kill fleas. It is important to thoroughly scrub all areas of your pet taking care not to get shampoo in the eyes. For severe infestations, you may actually see the fleas crawling up the dog's body towards the face area where the water does not cover. Make sure to drown and kill all the obvious fleas. Dry your dog with an old towel and brush the coat to remove any dead fleas or eggs. To get fleas out of a dog's ears, use a washcloth or cotton balls to clean the inside of your dog's ears using an ear cleaner. After you have washed the bedding, "bombed" the house, and bathed the dog, use a topical flea medication such as Frontline, Advantix, or Revolution to prevent new fleas from hatching. These medications primarily work by interrupting the flea's reproductive cycle. Monthly applications are usually necessary to keep fleas from infesting your dog's coat. There are also oral flea medications available from your veterinarian that are taken every few weeks such as Bravecto, Trifexis and Simparica. If you prefer more natural solutions, garlic, lavender, and neem may be used as a home remedy for flea prevention. These natural insect repellants may repel the fleas from your dog but sometimes cause skin irritations. Watch your pet closely for signs of a rash or contact dermatitis and discontinue use immediately if your dog shows any signs. Use a spray bottle filled with white or apple cider vinegar mixed with water (half and half) on your dog and repeat every day for approximately a week. Do not spray it on any areas where your dog has open wounds or very irritated skin or around his eyes. You can also put the solution on him with a cloth instead of a spray. A solution of vinegar (4 liters), water (2 liters), lemon juice (500 ml) and witch hazel (250 ml) sprayed around your home in areas where fleas congregate can kill them. Make "flea traps" with a solution of regular dishwashing liquid soap and water. Pour the solution in a small bowl and put them around your house, being careful not to put them in places your dog could get to and drink. Fleas landing in the trap won't be able to get out of the water due to the soap and will drown. In addition to your home, you should treat your yard to prevent any living outside from attaching to your dog and coming in. A professional exterminator can help with this or you can try using methoprene (Precor, Petcor, Altosid) on your own. It comes in a spray, fogger, and pellet format. Another option is food-grade diatomaceous earth spread on your yard. You can also make your yard friendly to creatures that feed on fleas such as indigenous reptiles and insects. You can even buy flea-eating insects and release them in your yard. While you can catch fleas from your dog, they are unlikely to remain on you for long. Because humans lack hair and fur like a dog, this creates a less hospitable environment for them. Fleas that land on you through contact with your dog's body, his bedding or during flea removal will bite you, however. If you notice bumps and redness on your skin, wash with some antiseptic soap and coat with something to soothe your skin such as cortisone cream or aloe. It's also wise when cleaning your dog to remove fleas to wear protective clothing and gloves on your hands. Wash thoroughly when you are done and put your clothes in the laundry and use a hot water setting. Ear mites also tend to happen mostly with puppies instead of adult dogs. Ear mites are usually accompanied by an unpleasant odor in the ears. You will never see ear mites as they are much smaller than fleas. The evidence of the presence of ear mites is a brown deposit found in the ears, as well as redness, inflammation and excessive scratching. Now that you know how to get rid of fleas on dogs, make sure you monitor your pet closely for signs of infestation. By keeping your pet away from areas prone to fleas and limiting the exposure to infected animals, the chance of re-infestation is low.